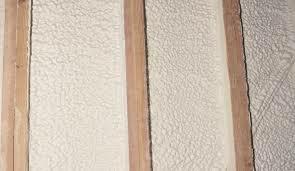 If your home needs new insulation, consider spray foam options. Gone are the days that your only choices were conventional insulation materials such as fiberglass or cellulose that needed replacing every few years. In fact, more and more Myrtle Beach, South Carolina, homeowners are installing polyurethane spray insulation for numerous reasons, one of which is the fact that once installed it will never have to be replaced. This means you will never have to worry about replacing insulation in your home again. Foam insulation expands, and this expansion means that it can fill the tiny holes and gaps in your walls, effectively eliminating the loss of expensive conditioned air. Increased energy efficiency that comes from sealing the holes and gaps in the structure of your house can reduce the workload on your Myrtle Beach home’s HVAC unit and lead to significant savings on your heating and cooling bills. It is water resistant, which means that it will not lose its insulating properties when it gets wet. Additionally, because polyurethane is an inert material, it cannot serve as a food source for mold and mildew. Because this insulation will never have to be replaced, home buyers find houses that have polyurethane insulation to be very attractive. Many homeowners can recoup the cost of installing this insulation when they sell their homes. When you’re ready to upgrade the insulation in your Myrtle Beach, SC, home, turn to the experts at 31-W Insulation. Our highly trained and experienced installation professionals can help you enjoy the numerous benefits of foam insulation.